As trite as it sounds, I never expected to receive a phone call from Ron Duggan, the main man behind the Lake of the Ozarks Shootout in Central Missouri, that the event’s committee decided to induct me into the Lake of the Ozarks Shootout Bob Morgan Memorial Hall of Fame. In fact, it still felt a bit surreal last night as I sat at the table with my wife, Stephanie, my longtime colleagues in the business, Teague Custom Marine owner Bob Teague and Shoot 2 Thrill Pix photographer Pete Boden, and two of my good friends from the lake—Diana Dorhauer (a fellow Hall of Fame member) and Justin Wagner of the widely respected Waves and Wheels. 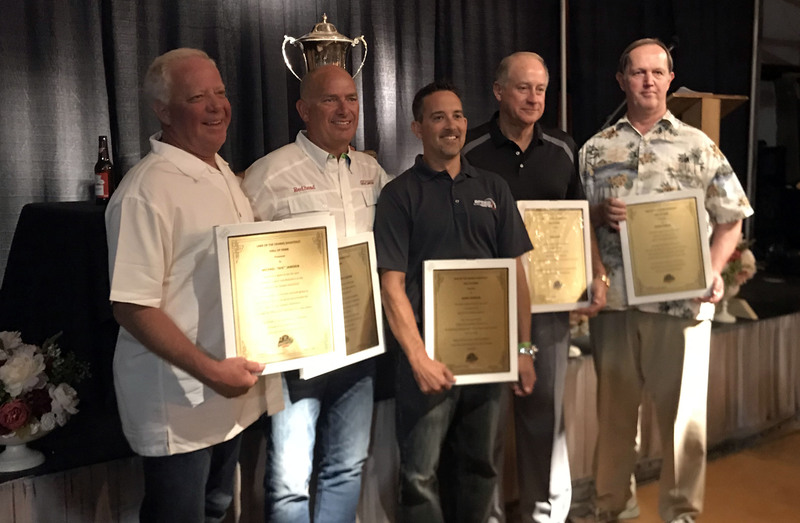 The 2018 Lake of the Ozarks Shootout Bob Morgan Memorial Hall of Fame class included, from left to right, Michael “Doc” Janssen, Mark Waddington (and the team at Performance Boat Center), Jason Johnson, Rob Lauer and Dennis Parvey. Not only was I being honored with people I had interviewed and covered in this sport for many years, I was the first journalist to receive the esteemed recognition, which has been bestowed on some of the all-time greats, including John Cosker, Mike Fiore, Bob Morgan, Randy Scism, David Scott, John Tomlinson and many others who have had a hand in the event from an organizational standpoint. This year marked the sixth time the Shootout inducted a class into the Hall of Fame that began in 2013 in honor of the late Bob Morgan, and the attendance at the event held at The Stables at Cannon Smoked Saloon was the largest one yet. It helps that one of the event founders, Rob Lauer, was recognized along with a legend at the lake, Michael “Doc” Janssen, the Shootout’s unofficial V-bottom king, Dennis Parvey, and the first business to get inducted, Performance Boat Center, which includes Mark Waddington, Brett Manire, Myrick Coil and a team of enthusiastic hard-working employees. Jason and Stephanie Johnson pose for a quick photo following the Hall of Fame ceremony at The Stables at Cannon Smoked Saloon. In a way, it sounds like a game of which one doesn’t belong with this journalist being the odd-man out. Never once during all of the Hall of Fame ceremonies I’ve attended did I think that maybe one day they’d add my name to a plaque on the memorial at Captain Ron’s Bar and Grill, the home of the Shootout for the past decade. But they did and for that I have to thank many people starting with the two guys who have allowed me to immerse myself in the Shootout—Duggan and former organizer and Osage Beach Fire Protection District Chief Jeff Dorhauer. Both of these well-respected men have given me, my former Powerboat magazine colleagues and now my partner in speedonthewater.com and fellow OffshoreOnly.com columnist, Matt Trulio, an all-access pass to the event. I’d also like to thank everyone who has showed me the ropes over the years at Lake of the Ozarks. People like the Dorhauers, Wagner, Brett Manire, Alvin Heathman, George Denny, Ed Champion and more. I’ve had so many people who call the lake home become some of my closest friends and that means a lot. Of course I need to thank my family, my wife, my two daughters, my parents my grandparents and my in-laws—the people who have supported me in my career path from newspapers to Powerboat to Speedonthewater.com, a business that has become more than I could have imagined with a following larger than I ever expected over the last seven years. Last but not least, none of this would have been possible if it wasn’t for my business partner and close friend, Matt Trulio, who initially created this fun, creative and sometimes challenging venture. Here’s the thing though, without the people who started the Shootout, continue to organize this event and put so much time and energy into it, as well as the participants who spend the time and the money and everything else that goes into making it to the Shootout, I wouldn’t have anything to write about. It’s really about them, without you there wouldn’t be a speedonthewater.com. And without them, there’s no way I’d be a member of the Bob Morgan Memorial Hall of Fame—an honor I will cherish forever. 1990 4.3L & Alpha drive Mercruiser Service Manual help?